Before you ask, no, those screenshots aren't photoshopped. 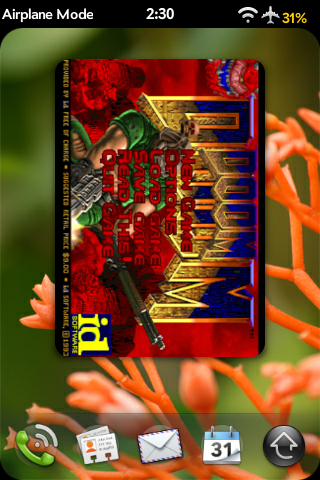 DOOM has returned to the webOS center stage and bringing along with it many future possibilities. Many will remember how back in June we covered the story of how it was possible to, with a bit work, get DOOM working on the Pre. Well, the webOS has come a long way since then. In webOS 1.3.5, we all learned of the existence of base OpenGL ES files, but it turns out much more was added. The folks over at WebOS-Internals, mainly ZSoc, Destinal, Rod Whitby, were looking through the webOS 1.3.5 open source packages which through a long, and frankly, very technical road, lead them to discover that 1.3.5 included Simple DirectMedia Layer (SDL). It doesn't open its _own_ card so much as it starts it's own surface, and when luna realizes it has to share the fb after the initialized virtual surface, it creates a hardware accelerated surface in a new card and shoves it in there. What does that mean to the average person? 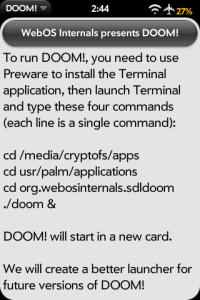 Well, 2 things: DOOM is hardware-accelerated, and DOOM will be able to minimize in card view! Of course everything is not completely polished yet, there's no icon in the launcher and it needs to be launched via Terminal, but this is still a huge step forward. SDL is often used in compliment with OpenGL, so it makes sense for Palm to use it. It does leave one wondering, however, what this means for the future. Will Palm go this route officially and support native apps, throwing web-apps out the window? As much as I would love that, and the games it would produce, the webOS was released on the principle of being based on web technologies. If it were up to me, I'd rather see a convergence of the two. Embedded native app objects in webOS html apps, webGL, or even Java applet support. Regardless, this is a very impressive advancement for the webOS and could signal a turning point in gaming on the Pre and Pixi in the homebrew sector. 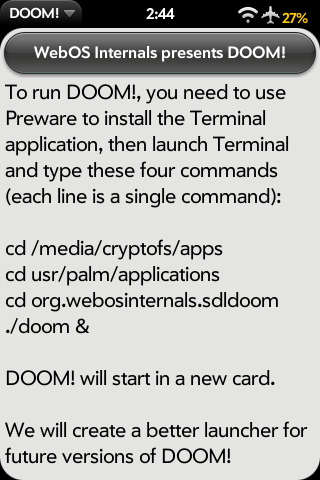 DOOM for the 1.3.5 webOS devices out there, is now available in Preware. For those not on Sprint, sorry, but you'll have to wait.